I have a warning message while burning an ISO file mastered with sonic scenarist. It only appears with parallel track path and layer 1 larger than layer 0. Please see the attached message. The DDP2 file mastered works fine at the replicator, and the burnt image is correct, but I have always this issue in this configuration. Just to advise it seems to be a wrong warning. And thanks for this wonderful tool! You can't burn PTP with normal drives/media and it's not possible to have more on layer 1 than layer 0 with OTP media. Your image shows layer 1 is bigger than layer 0. So, you're trying to burn an ISO file made by Sonic's application in ImgBurn? It seems Sonic made it incorrectly, but there's still a possibility you can fix this. You could try mounting Sonic's ISO as a virtual drive, go into ImgBurn's Build mode, and drag and drop all files and folders from the virtual drive into a Build project. Then, let ImgBurn build the DVD. It will ask you if you want to change all the various settings for DVD Video when you import the VIDEO_TS folder. If there's still some kind of problem, then Sonic did not author the VIDEO_TS folder correctly. The problem is beyond just the settings Sonic made for the ISO. And, are you use the ISO contents itself aren't actually larger than the size of a DVD+/-R DL? I can burn the image but it seems ImgBurn recognize it as OTP instead of PTP. This does not happen if L0 > L1. PTP allows layer 1 bigger than layer 0. As I said, I can burn it correctly, but I have a warning. I don't want to modify the ISO, as I'm sending the DDP to the replicator, not the ISO. Burning the ISO is just for testing the behaviour of my authored DVD. Burning the VIDEO_TS directly works fine. Can you post the log of you burning it please? As I said in my previous reply, unless you have some special hardware and media allowing you to burn an ISO created for PTP (and not compliant with OTP limitations), it's never going to burn 'properly'. Well, it seems to be burnt fine. You recommend not to burn PTP with layer 1 bigger than layer 0? ImgBurn never complained with layer 1 smaller than layer 0. I can not join a file any more. Technically, yes, the write and Verify operations might complete successfully and without error, but it certainly won't be 'fine'. At least not if you're doing it for testing before replication. Layer 0 on OTP media can only ever be greater than or equal to the size of L1. 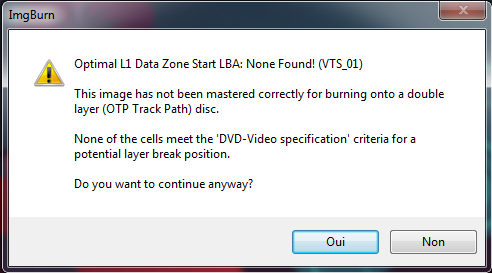 So the layout you're attempting to burn is incompatible with OTP discs and it's physically impossible to burn it with the layer break in the correct place. That's why you're getting the warnings from ImgBurn. So it's not about me recommending you don't do it, you flat out can't... it's impossible. The disc you're ending up with is nothing like the one you've actually created in scenarist. The physical layer break will have been moved to a location compliant with what's actually possible on OTP media. It may or may not be able to also adjust the ifo files on the disc accordingly. You can just copy and paste the correct ImgBurn session's worth of entries from the big log file - or zip the entire thing and upload that. OK, I understand, the media I'm burning to is OTP and not PTP. I will follow your recommendations to be able to test my authoring correctly. You can find the log attached. You've uploaded the graph data file and not the log. 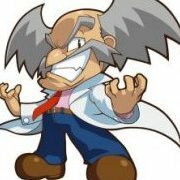 I 15:02:15 ImgBurn Version 2.5.8.0 started! W 15:02:15 AnyDVD can interfere with ImgBurn's ability to verify accurately, please ensure it's disabled! I 15:02:16 Found 1 BD-ROM XL/DVD±RW and 1 BD-RE XL! I 15:03:48 Set L0 Data Zone Capacity Succeeded! I 15:19:28 Export Successfully Completed! I 15:40:05 Set L0 Data Zone Capacity Succeeded! I 15:55:46 Export Successfully Completed!